Many of you have tried my little mini mince pies at my festive classes and a few have asked for the recipe so I thought I’d re-blog it for you 🤗. I make mini pies for my classes using a canapé or mini muffin tin – they come in at approx 47 cals per pie so are a perfect little mouthful, but you can obvious make any size you like! The recipe below makes 12 normal pies or approx 24-30 mini ones. These happen to be both gluten and dairy-free so everyone can enjoy them. Put all the ingredients for the mincemeat into a saucepan. Cook on a low heat, stirring frequently. Cook until the apple is soft and the mixture is thick – it may take some time. Remove from the heat and allow to cool. For the Pastry: Put the buckwheat flour and ground almonds in a processor and add the agave. Pulse and gradually add the water until it forms a dough. You may find you need more or less water. If it is too wet add a little more flour. You can also do this by hand in a bowl – it’s just a bit messier. Once it’s forming a firm dough remove, wrap in cling-film and place the mixture in the fridge. Preheat the oven to 180 C/ gas mark 6. Lightly oil a 12 hole cake tin. Remove pastry from the fridge and roll out on a lightly floured surface. Roll it as thin as you can – a few mm. 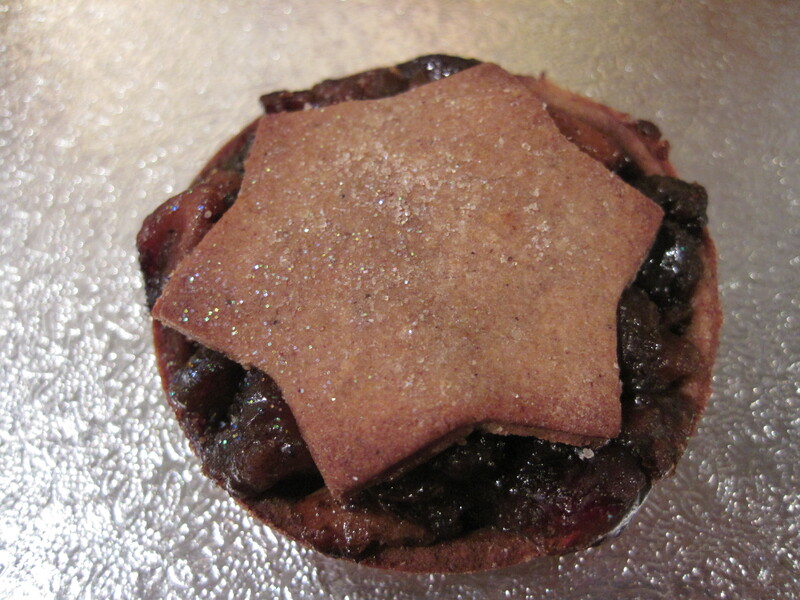 The pastry can be a bit difficult to handle so I find working with smaller bits at a time is easier. Use a round biscuit cutter to cut out 12 bases. Place them in the tin. Lightly brush with oil and use a fork to prick the base. 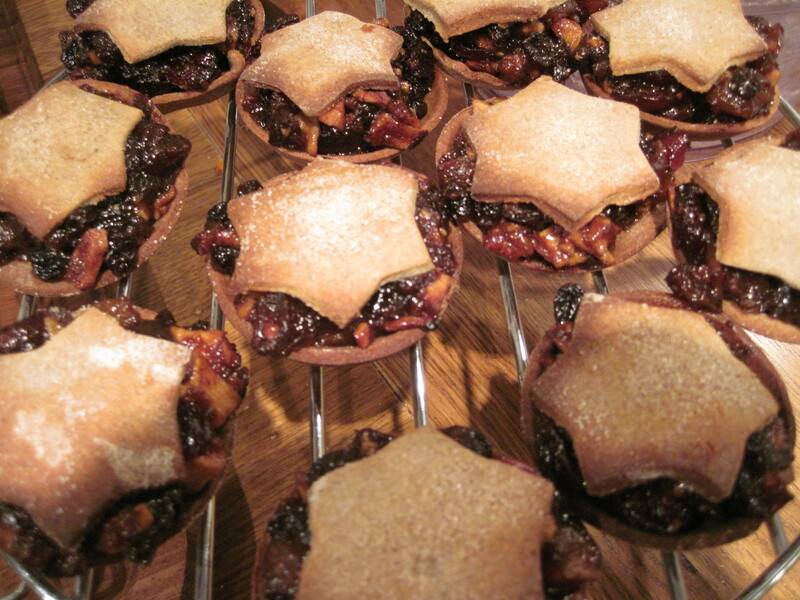 Place a generous helping of mincemeat in each of the cases and place your chosen “lid” on top. Lightly oil and sprinkle with a little cinnamon and sugar. Place the pies back in the oven and bake until golden (10–20 mins for large ones, 5 – 10 for mini ones). Keep a careful eye on them. You want the tops to brown but be careful the bases don’t burn. Remove from the oven and leave to cool for 5 mins, then remove and place on a wire cooling rack. This entry was posted in Christmas bakes, comfort pudding, dairy free, gluten free, pies and tarts, special occasions, vegan, winter puddings and tagged baking, christmas, christmas recipe, christmas recipes, dairy free, easy recipes, gluten free, recipe for christmas, vegan, vegan recipe, vegan recipes, vegetarian, vegetarian recipes by Dr Nancy P. Bookmark the permalink.